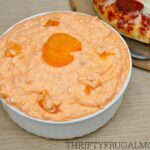 This creamy 5 Minute Mandarin Orange Jello Salad is such a light refreshing side dish or dessert. And it’s so easy to make too- all you need is 5 minutes! The one evening I can guarantee enthusiastic cheers from all 3 kids at dinner time is pizza night. In fact, if I happen to not put it on our $200 a Month Menu Plan that week, I know that I’ll have at least one child complaining because they miss pizza and wish we were having it! I typically make our pizza from scratch, but when life gets busy and I’m pushed for time, I definitely don’t have a problem reaching for store bought pre-made pizza! In fact, sometimes as busy moms, we just need to be okay with taking advantage of those little “cheats” to keep our sanity! And this past week definitely felt like a “cheat” was in order. I’m nesting like crazy and besides trying to get things cleaned up and organized, I’ve also been slowly working at putting some meals in the freezer before this baby arrives. As if that wasn’t making things busy enough, we ended being gone all day Saturday to look at houses in Philly in preparation for our move there this fall. So I was super glad Saturday evening that I had grabbed a Freschetta Pepperoni© and a Freschetta Brick Oven Mushroom & Spinach© at Walmart earlier in the week! They definitely were a lifesaver since I was beyond exhausted. And because they are made with high quality ingredients, including a sauce crafted with sun-ripened tomatoes, a crust that contains no chemical leaveners and 100% real provolone and mozzarella cheese, I can feel good about feeding them to my family too! I often serve salad with our pizza, but since I was out of lettuce, I was forced to come up with an alternative. 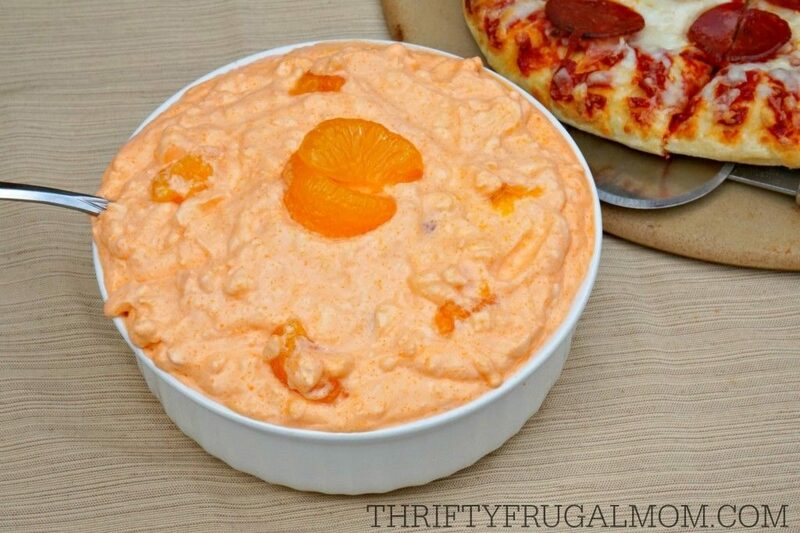 That’s when I remembered this refreshing 5 Minute Mandarin Orange Jello Salad that my Mom has made for years. It’s light and absolutely perfect for summer weather. And of course, I won’t complain about the fact that it whips up in about 5 minutes either! think the creaminess of the salad kind of won me over. Well, that and the juicy bitefuls of mandarin oranges. Yum! 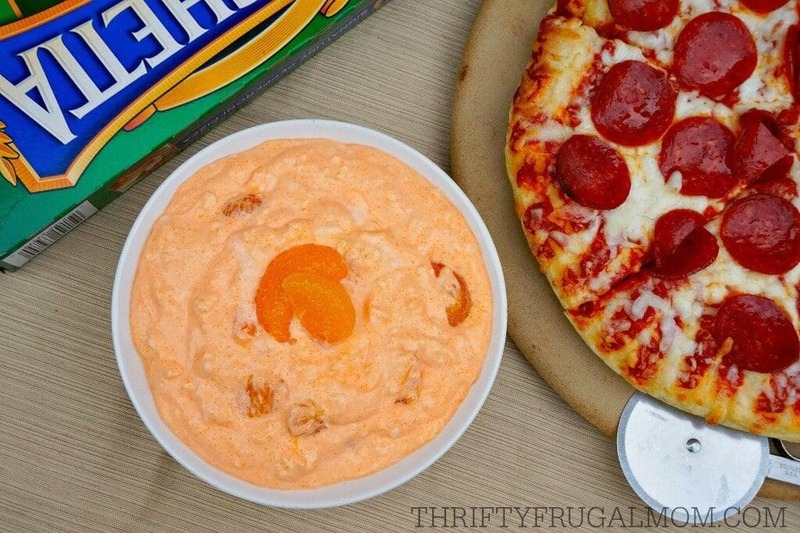 If you need a quick dish to pair with your pizza dinner or just want something light and refreshing to serve at your next cookout, I highly recommend this easy salad! It’s definitely a winner! Mix powdered jello with cottage cheese. Add mandarin oranges and combine. Fold in Cool Whip (or Real Whipped Cream). Best if refrigerated for several hours before serving, but it's definitely good right after it's made too! The chilling just helps it set up better. *Crushed pineapple or other fruit can be used instead…you could even change up the jello flavors for more variety! 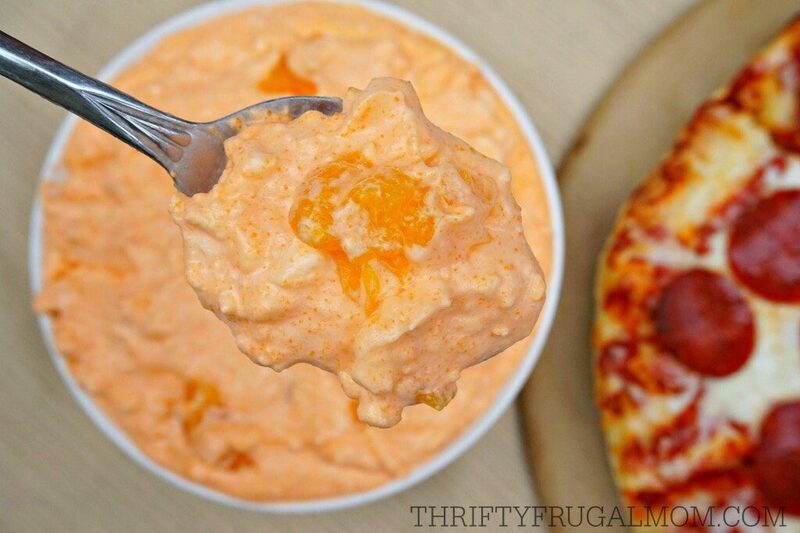 Interested in getting some Freschetta Pizza to have your own easy pizza night? You can easily find them at your local Walmart. Freschetta offers a variety of pizza flavors and crusts including Brick Oven Crust, Naturally Rising Crust, Artisan Crust and even a Gluten Free Thin & Crispy Crust! We have made that jello for years, but with raspberry jello!! Delicious. Oh, I can totally believe that raspberry jello would be delicious too! I'll have to try that one of these times when I make this. Yum! This is so easy to make very good too! 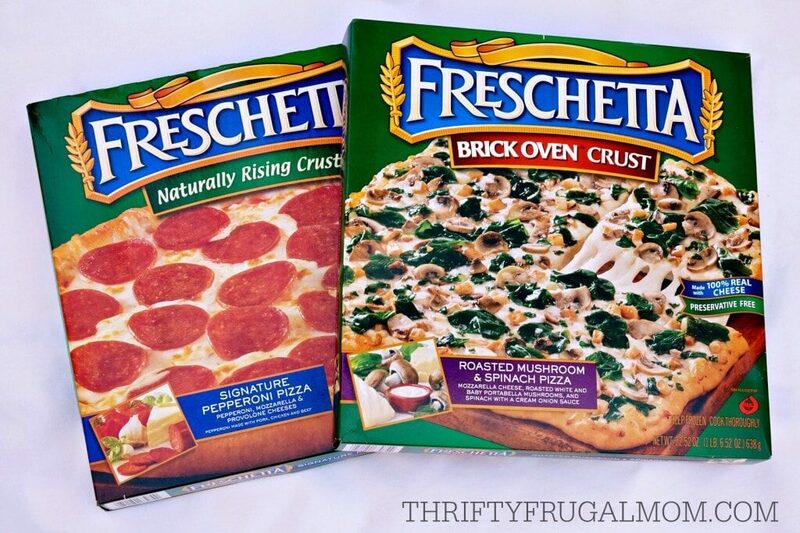 Good to have your input on freezer pizza i never buy it as have had too many duds but will try the Freshetta. And congratulations on your new arrival! I hear ya! We've had plenty of "cardboard" freezer pizzas too. 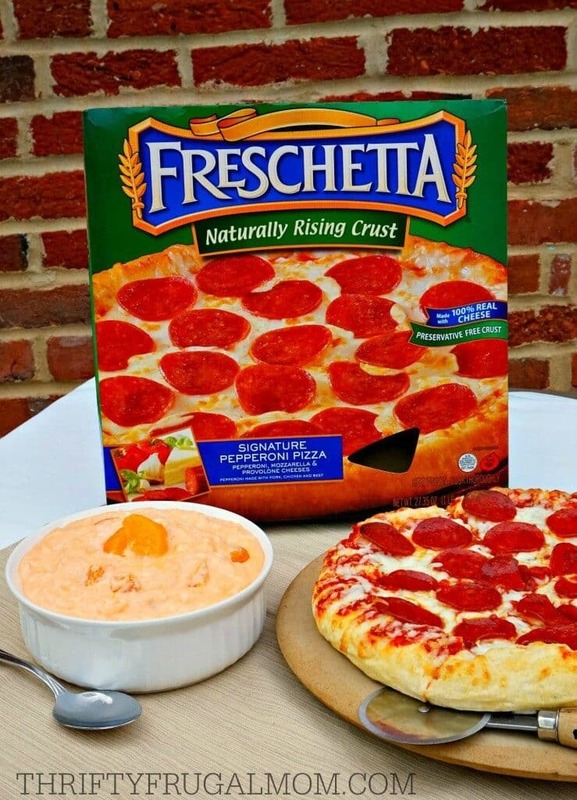 We like the Freschetta brand and have also enjoyed Dr. Oetker's pizzas as well. They are a little different with a thin crust and taste a little healthier, but we really like them too.